Team Fenesta, I find your products best in the market. The sales and services by Prins Marketing Company & by your engineer Mr. Himanshu Gupta are exc.. It gives me pleasure to put on record that the experience i got while getting fenesta windows installed at my project was very pleasant .Your skilled .. I'd just like to say, I have been really impressed with the communication and speed with which the time frame that the job was completed. You'll leave.. Team Fenesta, The below picture says it all about the looks and quality of Fenesta. I am very satisfied with Fenesta service and product. I will never.. Excellent work done by anmol and his team in window installation at my house ,flawless work and on time delievery and execution has made the look of m.. Impressed with the amazing quality & workmanship of Fenesta. It has enhanced my rooms ambience and served my purpose so well. Thanks to their sales an..
Had a great experience with Fenesta slider door installed at DTU (Delhi Technological University). The service we received through Mr. Gaurav was very.. Excellent service provided by team Fenesta at my site. Thanks for your great effort to serve your customer happily...Thanks to Satendir and Vinit ji f.. I am writing to let you know how much I appreciate the outstanding customer service that your staff provided. Your staff was very attentive and helpfu..
We experienced quality and committed work from Fenesta team ( Abhishek Chauhan and Sourabh Goel ) at our ongoing project Radisson Hotel Noida .we ackn..
We have recently installed Fenesta windows at our flat in Sector 18A, Dwarka, New Delhi. We are completely satisfied with quality of the product, Inst..
To Fenesta Team, We received excellent sales support from Anmol and service support from Pankaj Chauhan . Consistent follow up by both made us favour ..
Hello Fenesta team. We would like to thank Manjeet Singh,Ajay and every one in team for there great effort to make every thing happen so swiftly. From.. I want to commend you for your efforts and quality of the product installed on our project. We are happy to have Fenesta windows installed at our home.. Very satisfied with our Fenesta windows.....from the initial meeting right up to installation, found the staff to be very helpful. A special mention a..
Hi, Recently Fenesta windows installed at our new site in Manbhaban Apartment, Sector 10, Dwarka. We are very happy with the services Fenesta Thanks t..
We had another project of ours executed professionally & in a time bound manner in Defence Colony, ND, kudos to Mr Saurabh & Mr Ravinder, made sure al..
Great job done by Satendar and team. Good product. Great service. Always will go for Fenesta. Best in industry. Recommended to all. Getting one more w.. Excellent service from Satinder Singh Rajput and Sourabh Goel ( Window Experts ). We recently installed their windows in one of our Govt Project ( SPG..
Would like to appreciate Mohd Tahir, Vikram and project installation team @fenestawindows for quick resolution of my problem. Very professional in the..
Hi Team Fenesta,�I would like to say thank you to fenesta for providing best of best service I ever get, also a big thanks to mr.Satinder singh from s..
Hiii... I would like to thanks Mr.Satender and Mr.Saurabh for their excellent service. You have benefited us and have always worked towards achieving ..
We opted for Fenesta windows to sound proof and dust proof the house. Pankaj Chauhan was extremely helpful and prompt in helping resolve all issues du..
We had Fenesta to install the windows and doors at our house in Gurgaon. Karan from Fenesta sales team was very proactive and helpful. Fenesta provides with the best fitting and an awesome response to the customers. The perfect frame sets every window beautiful and serene. The timely .. Thank you for your good job! Your people very cooperative & helpful ! Vishal Ashok & Janak did a excellent job by convincing us. It is 95% effective &..
Hello Our gratitude towards whole Fenesta team. The knowledge and skills of your staff especially Mr Shubham Awasthi is really impressive and Producti.. I had fenesta windows installed in my apartment. Truly a sensible choice of choosing fenesta as being on the ground floor the apartment was exposed to.. Thank you to for the work order completion. While it took some time due to errors initially, am happy that at the end with Amar follow-up all outstand.. I would like to thanks Mr Ravinder Aggarwal and Isnaeel Haider for their instant support and timely execution of project. product finishing is very go..
Just recently got fenesta windows and doors installed at my house and very happy with the outcome. Thank you to Vijay, Karan and Pankaj for all the he.. Thank you Gaurav Khare for doing an amazing job. The services given by you were wonderful and satisfactory. I have got new upvc panels fixed by fenesta. Quality is good and whole process from ordering to installation was seamless. Windows were installed on t..
We want you to know that we appreciate your efforts and look forward to continuing our business relationship. Thank you and all the best for future! Good job by team Fenesta at our residence, especially Mr. Raghav Kaushal & Mr. Gaurav Khare. Appreciate the amount of effort put in by them. Thank you..
As a token of appreciation, I would like to thank your team Mr Satender Singh and Mr Shailendra for all the support and follow ups. They have a wonder..
Real professional work done by Fenesta and team. Special thanks to Anmol and Raghav who deliver the work on time and as conveyed that to in stipulated.. Installation was very well coordinated by mr anmol. He agreed to get the installation done on weekend and well within the stipulated time. Thanks to f.. This type of professionalism and commitment to the highest level of customer�s satisfaction has to be acknowledged. Having in mind such a pleasant exp.. It's great I have recently renovated my room with fenesta windows really mind blowing. Recently we had a pleasure of installing fenesta windows at home and I must tell you that we are very happy with the services provided by Shakti Chawl..
Good product and awesome team. Hi Fenesta, I just wanted to say thank you for the amazing experience. Thank you Mr. Amar & Raghav for all your help and your wonderful service. We ar.. Thank you Fenesta for the seamless and timely execution of our window order! The sales Team led by Pratik and the installation team Abhishek have been..
Our decision of going with FENESTA made us feel very satisfying, value is worth paying, quality is 200%, after support services of follow-up is amazin.. I'm a strong proponent of buying Brands, and we had such a great experience with purchasing for my house Fenesta Sliding Windows from you a few years ..
Congratulations to Fenesta team for creating a wonderful product. Customer satisfaction is guaranteed. Commendable job by Karandeep Singh and Satender.. This was our first experience with Fenesta and, we are delighted with our relationship and trust we can continue with the same arrangement in the futu..
From starting measurement till installation every thing was on time and hustle free . Once again would like to wish Fenesta great success in all futur.. Excellent service provided by Raipur team at my home. Thanks for your great effort to serve your customer happily... Thanks to pratish ji and service.. I would like to extend my great appreciation for the amazing work done by Ms. Shephali Dhawan & Mr. Abhishek by installing the door/ window at my Mana..
After all the scrutiny i have realised that the fenesta is the best UPVC windows and doors provider company. They excel in all the aspects such as qu..
We have opted for Fenesta windows for our new house and we are very happy with the services. Mr Satender singh has given us full support in getting th.. I have had a wonderful experience with Fenesta at Gurgaon. I had all of my old balcony doors replaced by Fenesta's doors. The construction is sol..
Hi�I would�like�thank�whole�fenesta�team for their best service and product.�Specially�Mr�Ravinder Aggarwal and Ishmael Haider done a good job thank.. I would like to appreciate Mr. Rishabh Gupta & team for succesful completion of 4 projects. I am writing this email as a token of thanks and appreciation for both of you. All my issues were sorted out with satisfaction. I would like to thank Himanshu and Ismaeel for their best services. They both have listened my requirements & work accordingly and met my expectations. I am really happy with the sample installled at OM CGHS Ltd by Fenesta. Hope to see same cooperation in remaining order. Special thanks to Pankaj & Anmol. Thank you for installing Fenesta at our Noida home with perfection & outstanding service by your team. We will surely recommend Fenesta to all of our guests. Thank you very much for getting Fenesta windows installed at my place. I appreciate the work done by your employees. I would highly recommend Fenesta windows. Just got Fenesta windows installed at my house. Very satisfied with the installation & the product. The installlation team ( Pankaj Chauhan and his Team) did a good job. I am an old customer of Fenesta. The service team did a good job in resolving my concerns. May I request you to please convey my appreciation to Sujit and the Service Team. This has reference to the supply of uPVC windows and sliding door. The supply was in time and installation work was carried out quickly. Hope to give Fenesta another order in future. I would like to thank you for timely delivery and smooth installation of all windows and doors to our entire satisfaction. Thanks to team fenesta . I am very satisfied with fenesta services. I had installed Fenesta Windows. For that I met Shubham and Anmol and I am quite impressed with their behaviour. They both helped me a lot from finalising the product to installation. Thank you for the excellent job done in a professional manner with regard to Fenesta glass window installation at my residence. You were very cooperative and responsive. This is in reference to the installation of Fenesta products at my residence. I would like to reiterate that I am extremely happy & satisfied with the installation of Fenesta doors & windows. I am really impressed with Gaurav Khare's dedication towards his responsibilities. It gives me immense pleasure to write 2 words for the efforts this guy has put in - HATS OFF!! My compliments on providing such a great sales and service of Fenesta Door @ Windows. I am extremely pleased with the quality of your product. We will be ordering from your company again soon. I got uPVC sliding door installed in my new project few months back. I would like to inform you that I am totally satisfied with the product and service provided by your team. Nettu Winntra - Winntra PEB and Roofing Systems Pvt. Ltd. I wish to put on record the name of Mr. Gaurav Khare who is extremely polite & has a sound knowledge of the product. I appreciate Fenesta & him annd would like to thank the entire process team. This is my first experience with Fenesta. I learned of them through searching the net for uPVC windows & Fenesta happened to be the potential "keeper" for me. My experience with Fenesta has been very good. Its been 9 months that we got it fitted at our new house and service & product quality is very good. 10 years of fram warranty is tremendous. This email is to express my thanks to the entire team for getting this job done on time. Would like to compliment you all for your job which has rebuilt my confidence in brand "Fenesta". First of all let me say that the product we are using is of very FINE quality. The overall support, level of commitment & dedication from you is amazing. You've provided us a feel of delightness. Thank you. Once again, kudos to Fenesta Team. I have recently installed Fenesta windows and doors at my residence. The whole process of order uptil delivery was very well handled by Mr. Sanjay. This is to confirm that the window installation at my home was done perfectly and I am very much satisfied with the wonderful job carried out. I wish you all the best for your future endeavours. I would like to thank Fenesta team for installing windows & doors in my flat. I really appreciate the commitment level shown by your team and I am really happy with the product & service. This is to appreciate job done by Anmol & Rahul Sharma at my house. They made the process so smooth and hassle free. I came to understand who made brand like Fenesta, it's the people. I got Fenesta windows installed at my residence. The entire experience from order booking, tracking delivery & actual installation was very professional with informative response at all stages. Fenesta was a pleasure to work with and this can be said about very few companies ! From the initial stages of discussion till the very last stage of installation it was hassle free. Thank you so much everyone for getting our project completed not only ahead of schedule, but also with best services. I appreciate the cooperative spirit & the attention to detail. This has reference to the installation of Fenesta products at my residence. I would like to reiterate that I am extremely happy and satisfied at the installation of Fenesta doors and windows. I would like to thank Fenesta team for timely installation of my window. All the team members who did the installation work were very cooperative and professional. I would like to take this opportunity to provide my feedback about the installation process and after sales service provided by Fenesta for the installation of 3 windows that I ordered. This is to provide a note of appreciation for client services provided by Himanshu Gupta for the installation of Fenesta doors and windows in our house. We are happy with the product and convinced our neighbour to get Fenesta installed. It was a great experience working with your team member Satender. Would like to thank him for the same. This is to acknowledge that M/S Fenesta, a Gurgaon based uPVC doors/windows fabricating company, has been associated with the American Embassy in New Delhi for past few years. This is certify that M/s. FENESTA BUILDING SYSTEMS has successfully supplied, installed and commissioned the new FENESTA Windows at 15th & 9th floor of TATA Centre for the office of Marketing & Sales Division of TATA Steel. 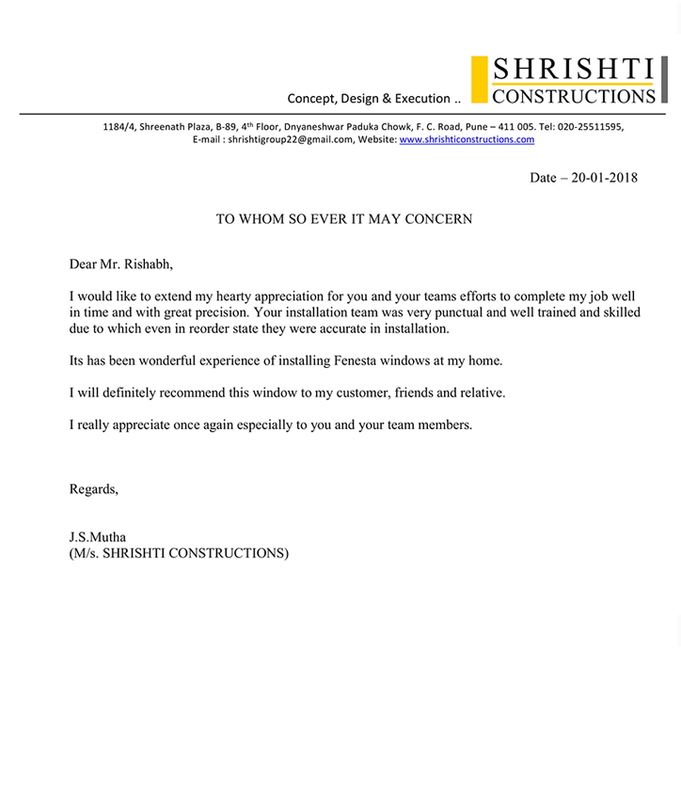 I would like to extend my hearty appreciation for you and your teams efforts to complete my job well in time and with great precision.Your installation team was very punctual and well trained and skilled.